Platelets are small blood cells that are formed in the bone marrow whose primary function was previously thought to be formation of the blood clot and the prevention of excessive bleeding. Now we know that the platelet is the most important cell in the body for tissue repair. All cells in the body whether they are bone cells, cartilage cells, nerve cells, liver cells, tendon cells, and eye cells heal the same way. All cells require the same nutrients and stimulants for growth and repair. Platelets release over 800 different protein factors that create the fertile ground for healing. Platelets start releasing these products within 10 minutes of activation and continue for over 7 days with most of the chemicals being released in the first hour. Without platelets, cells and tissues would not be able to heal or repair at all. The cells responsible for replacing damaged tissue are stem cells. Stem cells are present in all tissues of the body but are particularly abundant in bone marrow and fatty tissues. They are attracted to areas of tissue damage by the chemicals released from the platelets. Once the stem cells arrive on the scene they are further stimulated and instructed by the growth factors released from the platelets. These growth factors persist in the damaged area of tissue for about 10 days instructing the initial healing process. The growth factors stimulate changes in the DNA of the stem cells causing the daughter cells to be different (differentiation) from their parent cells. This chemical mediated differentiation makes the daughter cells transform into a new cell type ready to replace the lost or damaged tissue. In addition, these platelet growth factors stimulate the formation of a blood supply to feed the newly developing tissue. Once initiated by the growth factors in the platelets, the process is propagated by stem cells which may continue the healing for up to a year. Platelet Rich Plasma (PRP) represents a treatment modality for stimulation of healing in many tissues. All cells heal the same way; all cells require platelets to heal. PRP is a product created from blood where the platelets are concentrated to at least four times their normal concentration. The platelets are then stimulated to release their growth factors. Platelet Rich Plasma is a way to deliver a higher concentration of healing factors to a focused area that requires healing. It is this concentration of the platelets and their growth factors that is responsible for the additional healing properties of PRP when added to damaged or surgically approached tissue. Blood contains red blood cells, white blood cells and platelets. Plasma is the portion of blood minus the cells. Platelet rich plasma is plasma plus platelets minus the other blood cells. Platelets are fragile and are easily stimulated to release their growth and clotting factors so care must be taken to prevent premature stimulation of the platelets as this will result in loss of the growth factors. Platelets are activated by contact with collagen that is present in the subcutaneous tissues, the walls of blood vessels and the skin. Platelets are also activated in the presence of blood clots which contain fibrin and prothrombin. 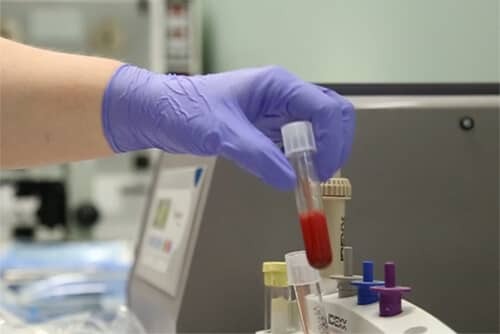 Therefore, the blood collection procedure needs to be a quick and clean stick with rapid transfer of the sample into an Acid Citrate Dextrose (ACD) containing tube. The ACD tubes prevent the blood from clotting and the platelets from prematurely activating. One tube will hold 8.5 ml of whole blood and is required for a smaller pet and two tubes are usually filled for the average size to large pet. When whole blood is centrifuged, it separates into layers. 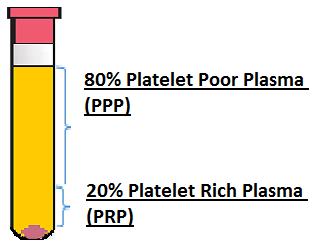 The bottom layer is the red blood cells, the next layer is the white blood cells (leucocytes) or buffy coat and above the buffy coat is the Platelet Rich Plasma (PRP) and above the Platelet Rich Plasma is the Platelet Poor Plasma (PPP). If the buffy coat is included in the PRP it is designated Leucocyte containing PRP or L-PRP. If the buffy coat is not included it is called Pure PRP or P-PRP. Current research on the use of PRP in musculoskeletal disease suggests that L-PRP is the product of choice for insertion into damaged joints, tendons, muscles and ligaments. In this case the leucocytes are anti-inflammatory. P-PRP, on the other hand, is the best version when PRP is used to stimulate stem cells. Leucocytes may actually be harmful to the stem cells. PRP can be activated with Calcium or Thrombin. This activation stimulates the release of the substances contained within the platelets. Activation with Calcium will result in a PRP gel that can be helpful in retaining the active substances within a surgically opened joint. Activation with thrombin will also result in PRP-gel with a longer incubation time. Platelet rich plasma is created by centrifugation whole blood (WB) at room temperature or below. There are two forms of PRP: Pure Platelet Rich Plasma (P-PRP) and Leucocyte containing Platelet Rich Plasma (L-PRP), P-PRP has only platelets with very few other cells and L-PRP contains white blood cells as well as platelets. Two centrifugation cycles are used to concentrate the platelets into a small volume of plasma. The aim of the first step is to deplete the product of red blood cells (and white blood cells with P-PRP) with minimal loss of platelets, and the aim of the second step was to obtain the highest recovery and the best yield of platelets in the smallest final plasma volume. Refrigerated centrifuges at 12°C have been thought to be best for platelet concentration, although when compared to 18°C (room temperature) there was no significant differences in platelet yield. When the temperature increases, it reduces plasma density and alters the blood cell behavior under the same centrifugation conditions. For the 1st Centrifugation Step, the centrifuge speed and time are very important. Centrifuge speed and rotor diameter determines the Relative Centrifugal Force (RCF) or Gravity (g) force. Because different centrifuges have different rotor diameters, different speeds are required to create similar RCF. Increasing centrifuge time actually reduces yield of platelets. A RCF of 300 x g for 5 minutes has been determined optimal for the first centrifugation of the WB. At Safari we have three centrifuges, each with different rotor radiuses. The radius of the rotor and the RPM determine the g force generated. For the 2nd Centrifugation Step, studies show that the best setting is a RCF of 700 x g for 17 minutes. Step 1. Blood samples collected. 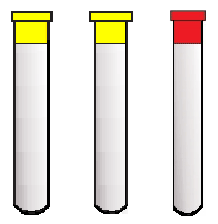 In 8.5 ml tubes containing ACD (Yellow Top Tubes). No NASID’s on the day before or day of PRP preparation. Collect blood before anesthetic premedication is given. Note: These recommendations about NASID’s and Pre-Anesthetics are not essential and should not be the reason to abort the procedure. Collect blood for Thrombin. Platelet activation requires thrombin. Use 3ml Red Top Tube (RTT), collect blood in same manner. Centrifuge this tube a 300 x g for 10 minutes. Aspirate 0.8ml of supernatant to be used in platelet activation below. Step 2. 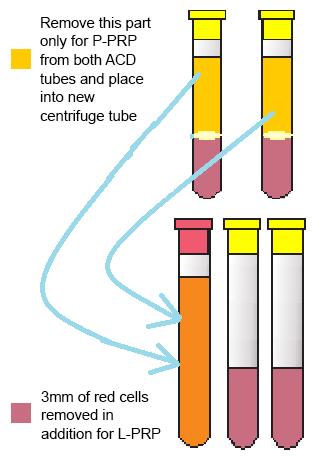 1st Centrifugation: Whole blood in ACD tubes are centrifuged at 300 × g during 5 minutes at 18°C. Use Medivet or LW Scientific Centrifuge at 1300 rpm. Use InGeneron set on PP1 Cycle/PRP Spin 1 for 20 min. Step 3. Plasma Separation from PRP. For Pure Platelet Rich Plasma (P-PRP). 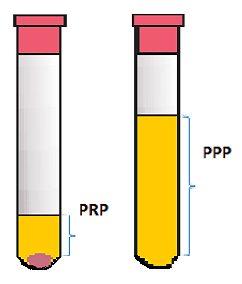 The upper fraction (P-PRP) is separated, without disturbing the buffy coat, and is transferred into a sterile RTT. For Leucocyte Containing Platelet Rich Plasma (L-PRP). The upper fraction of plasma including 2mm of Buffy Coat /Red Cells (L-PRP) is separated, and is transferred into a sterile RTT. This is repeated on both tubes with the PRP placed into the same RTT. Pipetted Tubes with plasma and buffy coat removed with small amount (3mm) of red blood cells also removed to ensure all platelets are collected (L-PRP). This Red Top Tube is now centrifuged at 700 x g for 17 minutes. 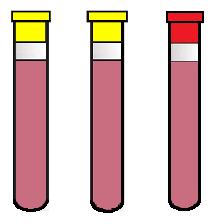 (PP2 Cycle) (PRP Spin 2) Note tube # 3 has a darker color because of red blood cell content (L-PRP only). Step 4. 2nd Centrifugation: PRP (P-PRP or L-PRP) after separation is centrifuged at 700 × g during 17 minutes at 18°C. Tube after centrifugation. This tube has a pellet of red blood cells at the bottom. This pellet will be larger when the buffy coat and red cells are collected as with L-PRP. Pipette off 80% of the plasma which is Platelet Poor Plasma (PPP). Place this into another clean tube. Step 5. Remove PPP. 80% of supernatant (PPP) is removed from tube above platelet pellet and placed into a RTT. The platelet pellet is re-suspended. 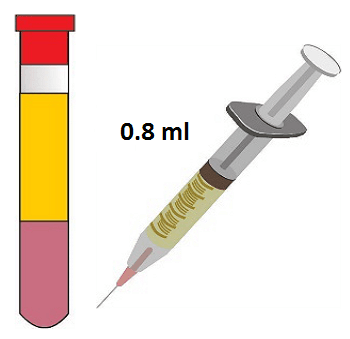 Using the PPP, the total volume of the platelet suspension is made to be 2 ml or desired amount. The PPP may be used to QS and re-suspend the PRP pellet to a proper dose for use. PRP Activation with Calcium Chloride. If the PRP will be used during a surgical procedure. PRP Gel can be placed into the surgical wound. Activation of the PRP is completed with calcium chloride. 10% Calcium Chloride is used and 0.1ml is added to each 1 ML of PRP used. This is allowed to set at room temperature for 15 minutes to form a gelatinous mass. PRP Activation with Thrombin. When the PRP is to be injected or mixed with stem cells it is best to use thrombin for activation. Thrombin causes a more productive release of growth factors from the platelets than calcium chloride. 0.2ml of thrombin is added per 1 ML of PRP. Thrombin is added into the syringe immediately prior to the injection. Depending on the use of the PRP, the PRP is activated using calcium chloride or thrombin or both. Platelet activation is performed immediately by adding 0.1ml of 10% CaCl2 per ml PRP and or 0.2 ml thrombin, incubating at 37°C during 15 minutes. Thrombin Collection after centrifugation the serum is separated from the clotted blood. This serum contains thrombin. Use a syringe to pull 0.8ml of this thrombin serum. L-PRP is used alone not mixed with stem cells. L-PRP may be injected into joints, tendons, ligaments or muscles. P-PRP is used to mix with adipose derived mesenchymal stem cells (ADMSC) prior to its administration. PRP has been used to treat non-healing wounds for more than 2 decades. In fact, the topical management of chronic leg ulcers was the first clinical application of platelets outside the blood stream with healing purposes. Dentistry: These include socket filling after molar extractions, implant surgery, PRP mixed with bone grafts, and in the treatment of mandibular tumor resection. PRP has been shown to increase the survival of fat cells during cell auto-transplantation for the treatment of tissue defects in plastic surgery. PRP enhances the survival of fat grafts that otherwise had a tendency to be resorbed by the organism. Significant reduction in the number of days needed to recover before returning to work or restart social activities after plastic surgery. There was a significant difference in the proportion of bones that were united after one year in favor of PRP. Posterolateral arthrodesis in lumbar spine surgery was enhanced when PRP was combined with cancellous bone graft as shown by densitometry in a prospective study. In fact, some studies point out the efficacy of PRP in reversing the degenerative trend of the intervertebral discs. Multiple PRP injections ameliorate pain and improves function and tends to be more effective that Hyaluronic Acid administration. Patients with lower levels of knee degeneration achieve better results than more advanced knee deterioration. Most studies in tendon pathology involve guided injections of PRP. Indeed, the development of real-time imaging techniques such ultrasonography enhances the safety and accuracy of PRP delivery during percutaneous management. The most commonly treated tendons in the lower limb were Achilles, the patellar tendon and the plantar fascia. PRP injections are used in professional athletes; the goal is to accelerate muscle healing, and avoid relapses through true muscle regeneration, i.e. absence of scar tissue. Especially in elite athletes the goal is to achieve rapid healing and resume competition faster than with conventional care. Dry Eye: Autologous serum administered topically has been used to treat dry eye symptoms because it can improve not only lubrication but also enhance lacrimal production. PRP is more effective than serum. Perforated corneal ulcers have been treated with PRP fibrin in a reduced number of patients. In all cases the corneal perforation was sealed after 3-5 days of stability of the membrane in the ulcer. When PRP eyedrops were compared to autologous serum eyedrops in the treatment of persistent epithelial defects PRP was more efficient than serum. The increase in vessel permeability and chemotactic signals from the injured tissues facilitates extravasation and movement of leukocytes within tissues by diapedesis. The use of PRP in this stage of healing modifies several aspects, first PRP increases vessel permeability. In addition, dopamine and noradrenaline are delivered from dense granules in platelets and histamine is released, all with synergistic effects in augmenting vessel permeability. PRP may influence both the amount of neutrophil infiltration and the survival of neutrophils in the injured tissues. In fact, PRP delivers chemokines that attract different leukocyte subsets and provides a strong chemotactic signal for neutrophil infiltration. In addition, PRP releases a known chemotactic cytokine for neutrophils. PRP can also modify the lifespan of infiltrated leukocytes by modifying the molecular environment of the injury. During the initial days subsequent to injury (from 2 h to 72 h) monocyte/macrophages gradually infiltrate the tissue, ready to clean up dead or dying neutrophils. Indeed, macrophages are specialized in clearance of death cells. The expression “macrophage polarization” refers to the ability of macrophages to change their functional phenotype in response to molecular signals they sense in their microenvironment. Assuming that manipulation of macrophage polarization can be a tool for therapeutic exploitation, it is imperative to gain knowledge about how PRP influences macrophages. In fact, PRP modifies the environment and macrophages can gain distinct functions supporting their participation in inflammation or alternatively in the resolution of inflammation. Fibrotic tissue is characterized by excessive collagen accumulation that hinders tissue regeneration. The presence of myofibroblasts is central to fibrotic tissue production. These cells thrive in the absence of oxygen. The supply of oxygen is essential for normal cell metabolism and wound healing. Indeed, poor tissue perfusion creates a hypoxic environment that impairs the healing process. PRP provides the opportunity to therapeutically manipulate angiogenesis by targeting multiple cell phenotypes. Crosstalk between cell types along with multiple signals constitutes the complex system that regulates angiogenesis. It has been demonstrated in last years that most organs have a resident pool of somatic, tissue specific cells. These stem cells are located in niches characterized by a typical spatial localization, the anchorage of stem cells to supporting cells, and the presence of typical extracellular matrix. These cells are docked in specific microenvironments that control their survival and self-renewal capabilities preventing them from exhaustion. In the niche, the integration of stimulatory and inhibitory signals determines cell quiescence. In general, these cells are mitotically quiescent. PRP contains agents able to restore mitosis in quiescent precursor cells, consequently mitotically arrested cells are able to divide again. By definition, these precursor stem cells are capable of self-renewal and have various potentialities for differentiation. In general, they are committed to differentiate in the local cell phenotype and are designed to substitute dying cells during turnover, trauma or pathology. In many cases of traumatic injury or disease the quantity and potency of this endogenous pool of precursor cells is insufficient to regenerate compromised tissues and migration and homing of mesenchymal stem cells circulating in the blood stream is required. PRP was shown to be effective in promoting the migration of MSCs. In addition, PRP can increase the number of MSC by stimulating proliferation. Nerve healing depends on equilibrium between Schwann cell proliferation and activation and neurotrophic molecules which create a regenerative milieu which helps axon repair and myelination. Several growth factors present in PRP have shown to promote Schwann cell proliferation, activation and differentiation which may explain beneficial PRP effects. These growth factors, for which Schwann cells and neurons have membrane receptors, trigger the expression and subsequent synthesis of classic neurotrophic factors such as nerve growth factor [NGF), Glial derived growth factor (GDNF), brain-derived neurotrophic factor (BDNF) and ciliary neurotrophic factor (CTNF).